Explore el dominio de los antiguos mayas en Belice en una excursión de un día completo desde San Ignacio. 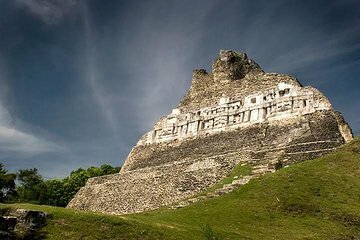 Sube a la cima de las pirámides sagradas y aprende sobre la antigua civilización en el sitio arqueológico de Xunantunich, y entra en un portal al inframundo maya en una aventura de tubing en cuevas que te llevará a través de las cavernas cristalinas de un sistema de cuevas subterráneas. También disfrutarás de la cultura beliceña en el moderno pueblo maya de San José Succotz. El transporte de ida y vuelta desde la ciudad de San Ignacio y el almuerzo están incluidos en este tour. Explore los aspectos culturales y naturales del distrito de Cayo, al oeste de Belice. Aprende sobre la antigua cultura maya y las prácticas religiosas con una guía experta. Flota a través de un sistema de cuevas subterráneas en un tubo. This package is the perfect balance of history and adventure. Elio was amazing! Highly recommend this trip. Highly recommend St Leonard's for this combo tour. Elio was our guide and did a fantastic job. He shared a lot of history, culture and wildlife with us and was very funny as well! This combo tour is a great idea. After touring Xunantunich in the hot sun the cool water felt amazing. Also with the timing of this combo tour we were able to miss most of the large cruise ship groups. The food served for lunch was also very delicious, I ate way more than I should have! My husband and I traveled to Belize for our one year anniversary. We wanted beach and jungle. Belize gave us everything we wanted and more. Our day trip to Xunantunich and cave tubing was led by Carla. She and her husband own and operate St Leonard's and her attention to detail is first class. Prior to booking this trip, I researched touring companies in the area and felt that St, Leonard would be the best choice for us. We were staying at a resort that offered tours but we didn't want the resort to dictate our entire experience. We wanted the real Belize. The tour was wonderfully choreographed, interesting and fun. What I appreciated most was Carla going at our pace, our questions and curiosity helped shape the tour of the ruins and cave tubing. We then drove to the cave tubing which should have been a long drive but Carla made it go by very quickly with conversation. Cave tubing was incredible and more fun then I could have imagined. I don't swim and Carla made sure I was comfortable and felt safe. I booked a 1 Day Private Tour of the Xunantunich Pyramids and Cave Tubing with my friend. There were two of us and the guide - Carla Juan. I have seen a lot of Pyramids and Ancients Sites around the world and have had a lot of guides, but Carla was by far the BEST. She is very personable and knowledgeable of the site, as well as the history of the whole area. She picked us up early in the morning and we were the first to arrive at this site. We toured the site for approx. 3 hours and she was extremely accommodating and flexible with our time, where we wanted to go, and what we wanted to see for the whole day. We stopped at a little Mayan village for lunch and proceeded to the Cave Tubing adventure. She explained the whole topography of the region for us during our trek to the start of the site as well as the trip down the river itself. She had plenty of water for us that day as well. It was by far, one of the best experiences I have had on these types of tours. I would highly recommend her for a Private Tour like I had. Thanks Carla, I will be seeing you again. To say that this tour was amazing is an understatement. Everything was perfect. Carla our guide was extremely knowledgeable and it made the experience better to have someone that not only knows their information but also loves to share that information with others. A must when in Belize!!! Great day trip made even better by the tour company and guide Leon. We stayed in a rented home Hillview House -Airbnb and they picked us up at the house. To make sure they knew where the house was they did a drive by the night before so there wouldn't be any delays. Trip started at the welcome center where our guide gave us a detailed history of the site and culture. Then on the the ruins where you can climb all the structures. If you are afraid of heights you may not want to climb to the top as there are no hand rails or railings. After touring the site our guide broke out a home cooked lunch of local food which was excellent. Chicken, coconut rice, salsa, plantains and pineapple. After that it was a 1 hour drive to cave tubing. A 45 minute walk leads to a 1 hour trip through 2 caves and then the river back to the start. Bring your own water shoes or you can rent them there for 3.00 USD. We Had a Great Time at Xunantunich and Cave Tubing. Tour guide gave terrific explanations of Mayan culture at some recently excavated ruins. Tubing was fun. Walking shoes a must for walking 20 minutes on river rock path. Ate a local lunch. Local guide customized tour to accommodate us as older tourists. Assume everything you bring cave tubing will get wet. Large operation with life jackets, helmets, headlamps, and showers when you are done. Awesome trip. Carla was a very knowledgeable and friendly tour guide. She went out of her way to make sure that my girlfriend and I enjoyed our day and she even made several out of the way stops when we asked. I would highly recommend this trip to anyone.